Ashmolean Museum 34 incised: Chantrey 1834. Bust only known from ivory reductions by Benjamin Cheverton. Statue 1837 in Manchester. NPG 316a(197) is a small outline drawing of this. 'He took a profile as large as life by camera lucida and then sketched a front view of the face on paper. We took a walk through his rooms and saw busts and statues without end. He then gave me the next day for a holiday, and told me I should see my head moulded in clay on Wednesday morning, at which time he invited me to breakfast. I went accordingly, and found, as he said, a head apparently perfect. He said he had not yet touched it, the head having been formed from his drawings by some of his assistants. He set to work to mould and polish a little whilst I was mostly engaged in reading the newspaper or conversing with him. On looking right and left, he found my ears were not alike, and the modeller had made them alike, so that he immediately cut off the left ear of the bust and made a new one more nearly resembling the original. Most of the time I was amusing myself viewing the pictures and statues in the room. At last he took a pitcher and blew a little water in my face (I mean the model) and covered my head with a wet cloth ...' (MS letter 2 May 1834 in Edgar Fahs Smith Memorial Collection of the Center for History of Chemistry in Philadelphia). Plaster models for bust and statue are in the Ashmolean Museum (546-34 and 547-35) and the marble statue itself, dated 1837, is in the entrance to the Royal Institution Manchester. An outline of the statue was etched by Du Val for the North of England Magazine, 1842 and a line engraving by J. H. Baker of the head was published in Henry's Memoirs of ... John Dalton, 1854, frontispiece. Twelve 'ivory' copies of the bust, 'reduced by a mechanical contrivance' were made by Benjamin Cheverton before the mould was broken up (Smyth, John Dalton 1766-1844: a Bibliography, 1966, p 69); a copy was shown to the NPG in 1961 by a private Dublin collector and another was sold Sotheby's 19 June 1970 (28). Having a short time since amused myself with attempts to sketch various interesting views, without an adequate knowledge of the art of drawing, my mind was naturally employed in facilitating the means of transferring to paper the apparent relative positions of the objects before me; and I am in hopes that the instrument, which I contrived for this purpose, may be acceptable even to those who have attained to greater proficiency in the art, on account of the many advantages it possesses over the Camera Obscura. Although Chantrey's device was known as a camera lucida, judging from Wollaston's illustration and Sir Henry Russell's description quoted below it was a variation from the accepted form and certainly does not tally with examples of the instrument in the Science Museum. However for the sake of convenience Chantrey's name for it has been used throughout this Catalogue. The drawings finished, clay models were made by studio assistants and completed by Chantrey himself, usually at several informal sessions beginning with breakfast and accompanied by friends to ensure that conversation would keep the sitter animated. The clay was then transferred to plaster casts (many of which were presented to the Ashmolean Museum by Lady Chantrey in 1842) and finally to the marble bust. On the day we were to begin he appointed me to breakfast with him ... The first day, he only made a rough sketch of the face, using an instrument with a tube, through which he looked, while, with a pencil fixed on one arm of it, he traced an outline of the full size on paper ... In the construction of this instrument, Sir Francis told me he had himself made considerable improvements. Mr Dunlop had been sitting to Chantrey, who fixed the back of his head in a wooden machine to keep him perfectly still, and then drew with a camera lucida the profile and front face of the size of life. He afterwards gave a little light and shade to the drawings, and said, "I shall not require you to sit still after this." I was desired by my late husband George Jones RA to offer for the acceptance of the Trustees of the National Portrait Gallery - various drawings, taken with the assistance of the Camera Lucida, by the late Francis Chantrey RA - of celebrated persons & some members of the Royal Family. May I ask you to have the kindness to make this offer known in the proper quarter ... Gertrude Jones. (MS letter in NPG archive). The offer was accepted by the Trustees in February 1871. The collection consists of 202 drawings, on Whatman paper usually about 47 x 62 cm (18 ½ x 24 ½ in), some with simple outlines marked with guide crosses and lines, others worked up into finished portrait studies. Most are annotated with the sitters' names but about 40 have not been identified. J. Holland, Memorials of Sir Francis Chantrey, 1851, reviewed in The Athenaeum, 1851, p 1039. George Jones, Sir Francis Chantrey RA: Recollections of his Life, Practice and Opinions, 1859, copy annotated and presented by the author in the NPG library. 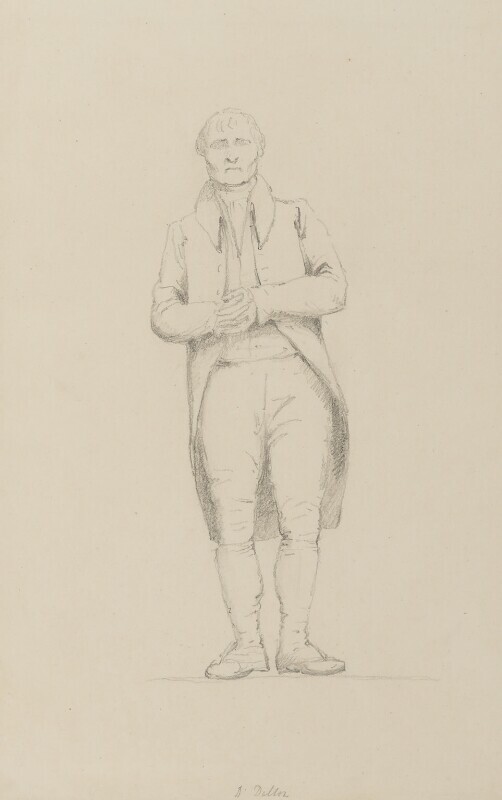 Alex Potts, Sir Francis Chantrey 1781-1841 Sculptor of the Great, catalogue of NPG exhibition 1981. Sir Francis Chantrey’s Ledgers of Accounts 1809-23, British Library (MS. Eg. 1911). Sir Francis Chantrey’s Ledgers of Accounts 1809-41, Royal Academy Library, to be published in a forthcoming Walpole Society volume. Whole-length standing with hands clasped. Sir Francis Chantrey; his executor George Jones RA and given by his widow, Gertrude Jones, 1871.